This post looks at an issue which sounds bonkers at first glance but could prove serious for landlords. The Deregulation Act 2015 brought in many new rules, many of them impacting on landlords’ ability to serve a valid section 21 notice. One of these is the requirement to serve on tenants ‘prescribed information’ – which in this context means the Government’s ‘How to Rent‘ booklet. I have to say that I rather approve of this – most tenants are ignorant about the complexities of landlord and tenant law and what their legal rights and obligations are. It is entirely right and proper that landlords should be required to give them with a written guide provided by the Government. I discussed the basic rules about this here. Needless to say, (and despite my efforts to inform them via this blog!) many landlords are also pretty ignorant about their legal rights and obligations – and so either forget or do not realise that they are supposed to serve this booklet at the start of the tenancy. But if so – what does that mean? The immediate consequence is that the landlord is unable to serve a valid section 21 notice. However, unlike (for example) default under the deposit regulations, the problem can be resolved quite easily. All you need to do is serve the booklet out of time and you are all right and able to serve your section 21 notice. A question has arisen about the correct booklet that you need to serve. I was first altered to this issue when I was rung up by Tom Entwistle of LandlordZONE the other week. He told me that he had been consulted by a lady in this position (let’s call her Mrs X) who wanted to serve a section 21 notice but had failed to serve the How to Rent booklet at the tenancy start. To her surprise, though, she had been told by the Council that she had to serve, not the current version, but the version of the booklet current at the time it should originally have been served – i.e. at the time the tenancy started. The tenancy had started in November 2015, and Mrs X became aware of the problem in about July 2016. 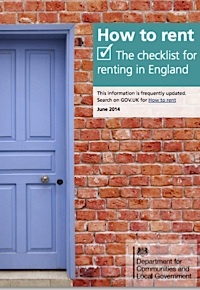 A new version of the How to Rent booklet had been published in February 2016. The Council were saying that the correct version for her to serve was the October 2016 version and not the current version from February 2016. “Was the Council right?” Was the question Tom wanted to discuss with me. My first reaction was that this was total nonsense. Of course, the Council were completely wrong. No doubt some clerk was making it up to be difficult. I started to say this to Tom but then thought that maybe I had better check. It is, after all, not unknown for the wording of legislation to have a different effect from what we all supposed – witness the problems we had up until last March with the deposit regulations after the Superstrike case. So what is the law here? (3) A notice under subsection (1) or (4) of section 21 may not be given in relation to an assured shorthold tenancy of a dwelling-house in England at a time when the landlord is in breach of a requirement imposed by regulations under subsection (1). Hmm. The wording “the version that has effect at the time the requirement applies” indicates that the Council may be right. If we take it that the requirement applies at the time the tenancy starts. The wording here “the version … that has effect for the time being” is unhelpful and a bit ambiguous. What does ‘for the time being’ mean? Does it mean at the time it was supposed to have been served? Which in our case would mean the October 2015 version. This sounds like a stupid point – of course, Parliament must have meant the most recent version. What is the point in serving an out of date information booklet? But actually, it’s quite important. Let’s take the case of Mrs X. Say she serves the February 2016 version of the booklet on her tenant and then serves her section 21 notice. The tenant then trots along to the Council who tell her that the How to Rent booklet is the wrong one and that she has a valid defence to any claim for possession. And that in the circumstances if she moves out of the property they will consider her to be voluntarily homeless and that they will only re-house her (and her three children) if she defends the case and loses. They are quite capable of doing this – particularly if they don’t actually have any properties available for the tenant right now and want an excuse to fob her off. What can the tenant do? Assuming she is on benefit and unable to afford (or even find) any suitable property for herself and her young family, she has no alternative but to stay in the property and defend any claim for possession. Of course, in a way we all hope that she will do that as we will then find out the answer! However court proceedings, particularly defended court proceedings, are unpleasant and stressful for both parties and will be very expensive for the landlord – whether she wins or loses. And she is unlikely to get her costs back from the tenant even if she wins. Defended possession claims are something which landlords should try to avoid at all costs. Don’t think that just because it is the most sensible answer, a court will necessarily plump for the option of serving the most recent version when the booklet is served late. The Court of Appeal have shown in several recent cases that they will follow the letter of the law – however inconvenient this may be for landlords. Witness the Superstrike and Kumarmasamy cases. Both of which caused endless problems until they were resolved – one by the Deregulation Act 2015 and the other by the Supreme Court. So my advice for landlords is – that until this matter is resolved by a decision from a court of record, you should serve BOTH booklets. Then whichever way a court eventually decides – you are covered. Should you need it, you will find an archive of the older How to Rent booklets on the Nearly Legal site here. I very much hope that if this ever goes before a court, they will take the sensible view and say that if the How to Rent booklet is being served late, and there has been a new version issued since the date the booklet should have been served, then the new one is the one to serve. After all, this is the booklet which will be available on the .gov website. And the legislation does not specifically say that the booklet HAS to be served at the start of the tenancy. However, we all know that sometimes laws are interpreted in stupid ways. Which is why we have to take into account that stupid rules may apply – and protect our position as best we can. Tessa I must take issue with you on the the desirability of the booklet. I believe it is no more a landlord’s business to educate his tenants on Landlord and Tenant law than it is a supermarket’s to educate their customers on consumer law. The cynic in me says that the booklet and the pedantic insistence on the latest issue (note that the issue is timed to the minute) is a ploy by government to put yet more obstacles in the way of legitimate eviction. You can serve the booklet by emailing the pdf – if the tenant has consented to this (note that my Landlord Law tenancy agreements all provide for this as standard). I agree it would be helpful if service of the booklet could be by linking to the website – particularly as the Government now provide an html version. The point is that the Law says it has to be the valid one at the point you are “required” to give the guide. You are “required” to give the guide at the outset but do not commit an offence if you do not, nor if you do not at that point issue the CP12 and EPC. However, if you fail to issue it initially or at any date earlier than when you want to serve a s21 notice then you are “required” to give it before you can give a section 21 notice. The How to Rent leaflet issued to tenants surely must be the current version if it was not originally issued when it should have been. Even by this Government’s standards it just does not make sense to require an older version to be served when if the tenancy had started earlier this year and the 4 months embargo been passed, you have to serve the latest version. Logically if the leaflet has been updated and a version is being given to a tenant the Government must want its latest information issued? If there is available a later version (now Feb 2016 as opposed to original October 2015) and a tenancy started say November 2015 and the leaflet was not issued at the start but is to be now, you issue the latest version now available when the s21 is to be served today, which is the February 2016 one? It has to be the latest version as what is the point of issuing today a leaflet dated October 2015 if there is a later version available, February 2016. For logical support of this view, just look at the rule for renewals and especially Statutory Periodics. If the document has changed since it was last given, you have to give it again at the beginning of the ‘new’ tenancy, particularly on a tenancy going statutory periodic. If it has not changed you don’t have to do anything. But if you do reissue, the LAW requires it has to be the latest version. So why should it be an older version if the purpose is different i.e. serving a s21? Ask Tom to ask the Council who thinks it has to be the original to quote from Statute where it states that is what is required. Ask them too if they would also be happy if an old CP12 was issued and an EPC that was over 10 years old, doing so has the same logic as issuing an obsolete leaflet – none. I had a tenancy commence on 1st Feb 2016 but served the Oct 15 booklet as the new booklet was not available when I was preparing all the paperwork for the check in. I’m not expecting to have to serve a s21 but will now forward the Feb 16 version to the tenants (just in case). Thanks for your recommendations Tessa. I think you are touching the crucial point here, Tessa: Does the wording suggest that the document is to be served at a particular time of the tenancy? It is arguable and it looks like some Councils will be taking it that way. Ask any Council adopting that approach to quote Statute chapter and verse. If you want pedantic how about a Court invalidating a s21 because the wrong leaflet has been served as well as the right one? Why demand the latest when a tenancy goes statutory periodic but serve the obsolete one in the fixed term. Just totally illogical. Anyone know anyone senior in DCLG? I still find it amusing that the statement “The Deregulation Act 2015 brought in many new rules” can be thrown about without irony. Might there be an aspect of the law which is current and mentioned in the ‘How to Rent’ booklet. The rule could be subsequently altered but still applies to a tenant whose tenancy started when the rule was current. So the tenant would need the ‘How to Rent’ booklet which related to the date when their tenancy started. That is a very good point and one in favour of issuing all versions as they come into existence. Tessa should we be keeping a copy of the actual one served on our tenancy files? I have not done that so how can I prove which one I have served? Would you just resend it with a letter or send a new one at the same time as serving the section 21 notice? It could be a bit of a waste of paper / hard drive space to keep actual copies every time but it would be a good idea to make a note of the version or publication date of the one you serve.